St. John became the focus of Professor Cynthia Moulton’s book after her more than 15-year history of traveling to the Caribbean Island with Castleton students enrolled in her courses. 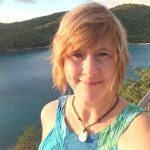 Moulton spent a good part of the 2015-16 academic year on sabbatical surrounded by wildlife, tropical climates and the blue waters of St. John as she worked on her book. The product of her explorations was an ecological narrative novel highlighting the U.S. Virgin Island of St. John. 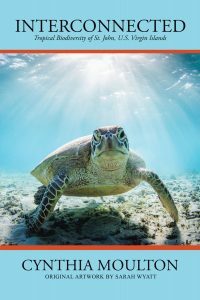 Titled, Interconnected, Tropical Biodiversity of St. John, U.S. Virgin Islands, the part memoir, part travel diary, takes readers on a tour to discover the fascinating lives of animals residing in the sea, sand, and trees of St. John. The book details the mysteries behind the island’s subtle web of life, along with the beauty, grace, and journey for survival of its most well-known species. Sarah Wyatt, Class of 2015 served as the books illustrator after previously completing a biological illustration course with Moulton. While on the island, Moulton lived at the Virgin Islands Environmental Resource Station and worked as the Education Director for their Caribbean Eco-Camps. Her sabbatical journey also brought her to the Galapagos Islands, Ecuadorian Rainforests, Cambodia, as well as Iceland. “All of my travels pertained to my teaching, and becoming more informed about subjects in ecology, evolution, and water resources,” said Moulton. © 2016 Castleton University. All rights reserved.